Every summer between Memorial Day and Labor Day, American consume over seven billion hot dogs. For over a century, this traditional German cuisine has found a new life in the United States, becoming the unofficial treat for baseball games, barbecues, and poolside. With so many years as a part of the American culinary story, everyone has their own hot dog recipe. From the carts of New York City to the eateries of Chicago, everywhere in the U.S.A. has its own unique take on the classic confection. The hot dog has become such a famous icon for American culture that an annual hot dog eating contest is hosted on the Fourth of July in Coney Island, New York. Place hot dogs directly over the heat. Regularly turn hot dogs to cook thoroughly but avoid burning. Hot dogs are done cooking when they have expanded but before they’ve started popping and sputtering. Move cooked hot dogs to the side of the grill with no direct heat and place buns over the direct heat. Give them a minute to toast before removing buns and hot dogs from the grill entirely. 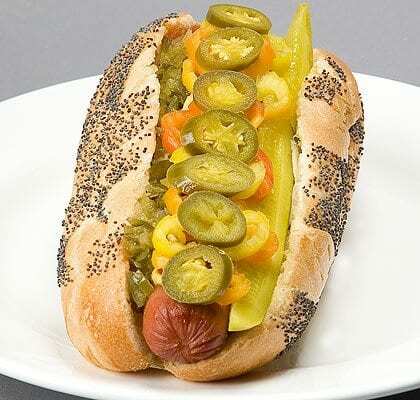 People across the country dress their hot dogs with a number of peculiar condiments, such as Doritos, black bean salsa, guacamole, macaroni and cheese, mango salsa, arugula pesto, caramel popcorn, and dozens of other odd but mouth-watering toppings. But that’s what makes the hot dog so incredible. You can do so much with it when inspired to do so. Apply liquid condiments (mustard, ketchup) before solid ones, such as pickles and peppers. Always serve plain, poppy seed, and sesame seed buns so guests have their favorite options available. Use cloth napkins and paper plates. Mt. Olive SpearDogs, or any hot dog, is a casual food that should be enjoyed in a fun and relaxed atmosphere. Dig in with your hands. Hot dogs in buns are intended to be consumed with your hands, not a knife and fork. Serve iced tea, lemonade, cola, water, and beer with hot dogs. Hard alcohol and wine should be used for more formal meals. Find our pickles, olives, and relishes at your local grocery store, Target, and Walmart. Grill or cook your hot dogs to taste (use the tips provided above to grill hot dog to perfection). Variations: Like it hot? Add Mt. Olive Jalapeno Slices or Hot Banana Pepper Rings to taste. Or, add Mt. Olive Sweet, Dill or Hot Dog Relish to pep it up! Add the hot dog, and a Mt. Olive Kosher Dill Spear, to the bun. Then, build your hot dog with your favorite condiments. You'll enjoy that terrific Mt. Olive flavor and crunch with every bite!